Custom Molded Rubber, Silicone, and Liquid Silicone Rubber Parts manufactured in our USA facility or from our partners in Asia. We make 100's of tools per year here in our USA facility, and also source 100's of new projects in Asia. We can meet all your needs for any volume custom molding of rubber and silicone while sharing our expertise of almost 50 years of manufacturing. 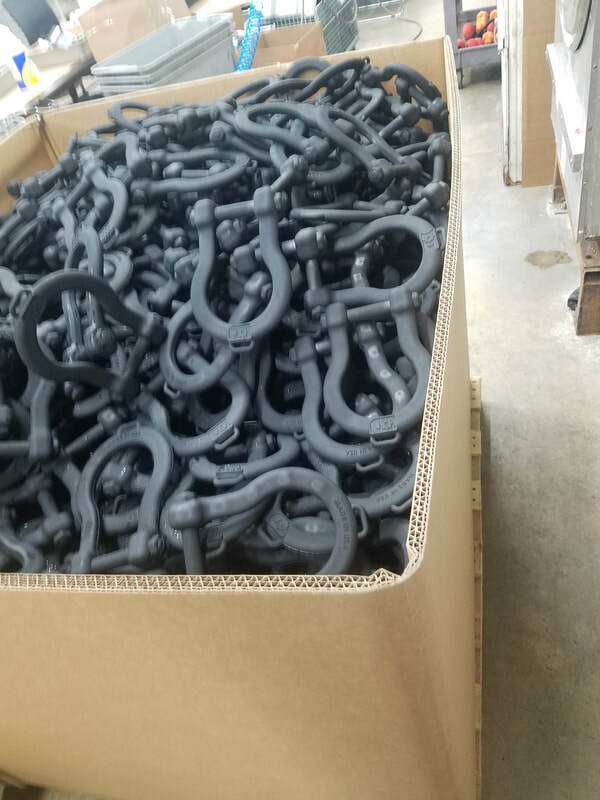 All of these point to your project of custom molded rubber and custom molded silicone with our years of experience leading to your project success in the most cost effective manner while being within budget, and on time. ​With our partners in China, we provide the fastest and most complete options for all your custom molded rubber and custom molded silicone projects. Here are just a few of our renowned customers. Start Your Project - Click Here! We offer the fastest prototyping service: Many companies claim to offer rapid prototyping, but only RII gives you the fastest prototyping service in the industry. Rubber prototyping and silicone prototyping can often be completed in just 72 hours instead of days or weeks, and small and medium sized businesses get the same great prototyping service as our long list of Fortune 500 clients. We offer transfer molding of high volume and medium volume components: Custom molding using the transfer molding process is ideally suited to larger production runs, but our economies of scale allow us to offer highly attractive prices to clients with more modest requirements. We've molded with thousands of transfer molds, which is an inexpensive mold to build, and we have the latest and most efficient equipment and machinery. We also consolidate our operations under one vast roof to lower costs further and save you even more. We have a team of in-house chemists: Custom molding using the transfer molding process is only as good as the compound used. Our team of in-house chemists have decades of industry experience creating formulas designed to endure rigorous conditions and withstand extreme temperatures. Whatever you need your transfer molded component to do, our chemists will ensure that the finished product is up to the job. We have a state-of-the-art facility: Our design, prototyping, engineering and manufacturing departments are all located in our sprawling Minnesota campus. We have invested millions in just the last few years into the latest presses and other equipment to make sure that our clients receive the best products possible at the most competitive prices. The names you know trust us: Our client list reads like a who’s who of business giants. Multinational corporations like General Electric, DuPont and 3M keep coming back to us because they know that the failure of even a minor component can delay or derail projects that they have invested millions or billions into. They need the job done right, done quickly and without fuss, and they know that RII can deliver. Transfer molding requires secondary raw material preparation into pre-forms. These pre-forms require placement into a "pot" located between the top plate and a plunger. It is important to control temperature in the molding process because the tool is open longer than when injection molding. All of our presses have very tight tolerances for temperature control. When the pre-forms are placed into the pot, the mold is then closed and the material is compressed by the plunger and transferred through sprues into the cavity below. With mold cavity starting in the closed position, our state of the art CNCs tight tolerances are maintained in the molding processes. Color molded rubber parts benefit. 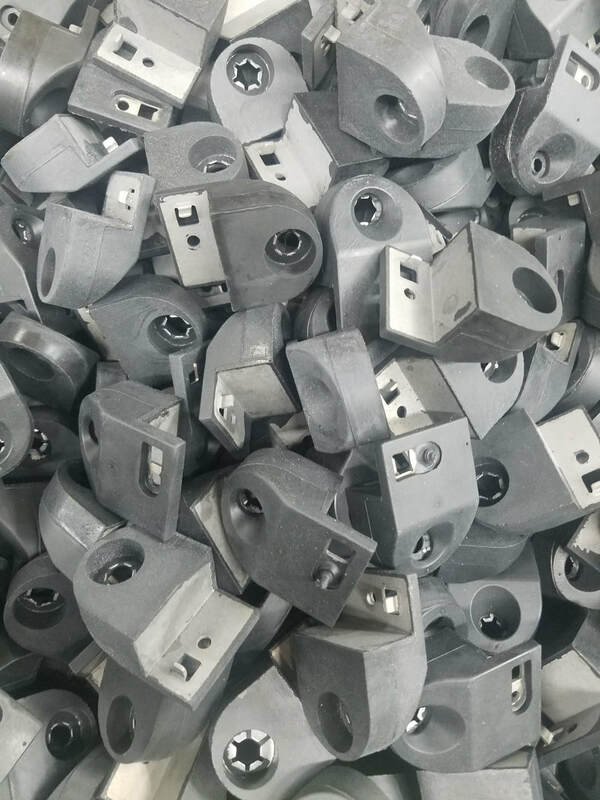 Pre-forms can be cut by hand from raw material, thus reducing the chance of contamination that can result from the mechanical prep of compression molding or the injection screw and barrel in injection molding. The primary disadvantage of transfer molding is found in the increase of waste of material or excess flash. This can be seen in the "flash pad" or the rubber left in the pot after the transfer is cured which can either be recycled or discarded. 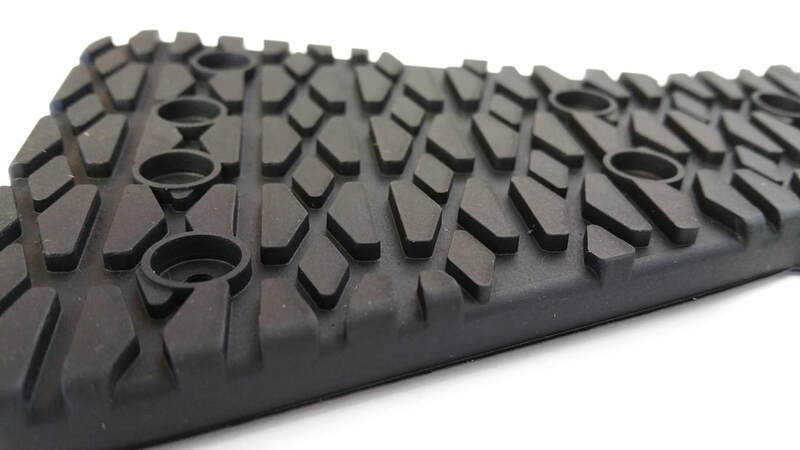 Rubber Industries can offer a variety of other molded rubber products through compression molding and injection molding or compression molding. Rubber Industries has been in business for nearly fifty years and we've spent that time perfecting the craft of making custom rubber products. Our facilities are fully equipped with qualified experts and the modern machinery required to create the products you need. We have multiple modern injection presses to meet your specific project demands, the largest CNC shop in the industry, and a multitude of compression molding and transfer molding presses. A major part of our business is the production of overmolded and rubber to metal bonded parts. 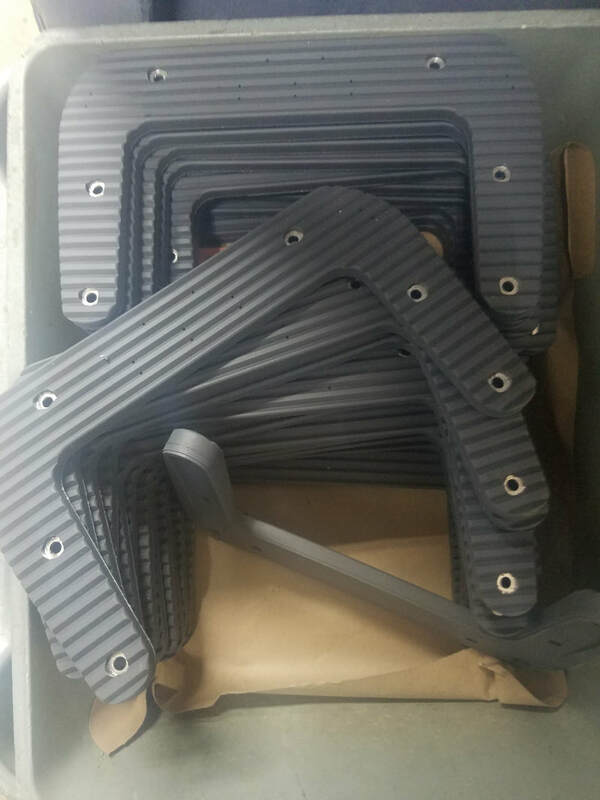 We can use EPDM, Butyl, FKM, Nitrile, Viton, SBR, HNBR, and a number of other materials in the transfer molding, compression molding, and custom injection molding processes to create the exact product you need for your project. Which material is used is completely up to you and what best suits your project. Our work with EPDM to metal bonded, FKM to metal bonded, Nitrile NBR to metal bonded, and many other rubber to metal bonded pieces has been honed and perfected over the course of decades. This ensures that you receive a quality product in record time every time that you partner with us. The actual molding method is almost a middle ground between custom injection molding and compression molding. With the compression method, an open cavity mold is used. With injection molding, the cavity is closed. During the transfer method of molding, the cavity is opened much longer than in injection molding, but it does use a closed mold similar to injection for high precision and economical use of the material. This also allows us to cure the end product with a staggering amount of accuracy. This results in minimal set backs and maximum productivity. It's a fast method to produce medium to high volume of parts. We start with a closed mold for high precision, place a pre-form into a pot located with the mold, and use pressure to force the material into the mold cavity. It's a relatively quick method to produce medium to high volume of parts because we only have to install a single pre-form, allow the product to cure, remove the product, and clean the pot to start a new cycle. Since we start with a closed mold for high precision, the end product keeps the dimensions of our CNC custom tooling. 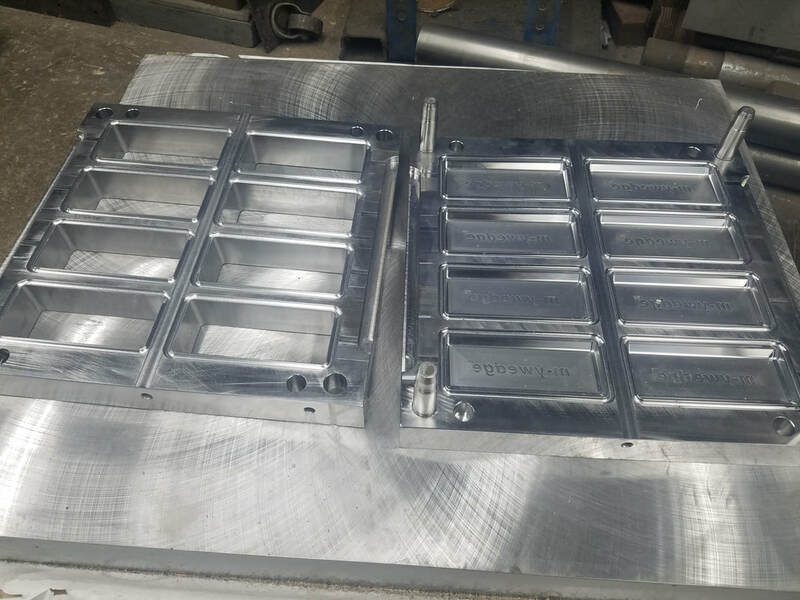 The mold isn't held open by waste or excess and all of the material is forced to adhere tightly to the parameters set forth by our custom tooling. The only downside to using the transfer method is that it produces more waste than high volume injection molding and the compression method. However, the waste remains in the pot, or it can be found on the flash pad. This means that we can easily retrieve it and recycle it. We also have another quick method to produce medium to high volume of parts. That's injection molding. It can do a number of the same tasks that the transfer method can do, but there are some differences between the two processes, too. We can use all of the same materials for both processes. We can create metal bonded pieces with the same amount of variety. They both utilize a closed mold for maximum precision. Both methods allow for consistent and accurate curing of the material used. The injection method doesn't use pre-forms. Material is processed in bulk through stripping and feeding. There is a lot less waste in injection molding. There is less involvement from staff due to pre-forms being removed. We have multiple modern injection presses to meet your specific project demands. These can be used for both high volume and low volume production runs and we can even make dual durometer pieces with them. Rather than forcing a pre-form through a pot and into a cavity, injection molding feeds material into a processing screw that heats the material and injects it at the same time. This reduces the amount of labor and time used to make parts. It also ensures that the proper amount of material is used with each cycle. 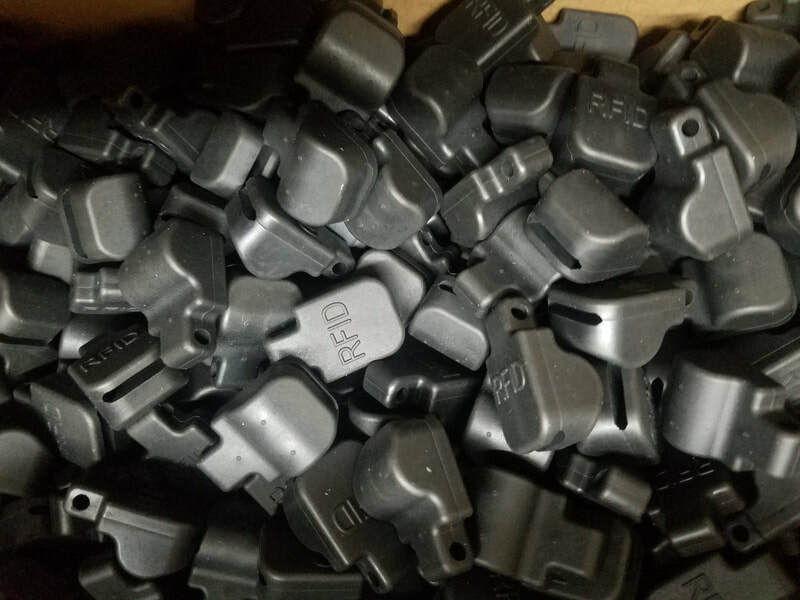 We can use injection molding to create metal bonded pieces like nitrile NBR to metal bonded, overmolded pieces, and more and we can do it in either high volume or low volume production. Seals for valves with rubber-to-metal faces. Electrical components such as wires that must be insulated individually. Lips or U-clips that require highly defined lip edges and sharp cutoffs. The transfer molding process, like the compression molding process, begins with preparing the raw materials that will be used. After the unvulcanized compounsd has been measured into pellets or pre-forms, it is placed inside a transfer pot located above the mold’s cavity area instead of directly inside the mold. This pot is then put inside a hydraulic press. The mixture is then forced into the mold by a heated piston using a runner and gate system. The piston remains in the down position until every nook and crevice inside the mold is filled and the high heat and pressure involved has cured or vulcanized the compound. The mold is held closed while the compound is being cured, which is why the process is so precise and often compared to injection molding. Once the compound has cured and cooled down, the plunger is withdrawn and any transfer pad material is removed. The mold can then be opened and the finished component is removed using a knock-out system. The final stage of the process is removing any compound residue left in the transfer pot and cleaning the mold. Shorter production cycles: Cycle times with transfer molding are shorter than they are with compression molding . Design flexibility: Transfer molding is an ideal solution when delicate and intricate parts are needed on a budget. The process can produce sharper edges and highly detailed components. Less waste: Transfer molding is a closed process, which means that it produces lower amounts of flash and less secondary trimming is required. Lower labor costs: Labor costs are lower with transfer molding than injection molding because only one pre-form is required. The molds used can also be made quickly, which saves even more time. Speed: Quick to mount into a molding press and get you parts quickly. Tight tolerances: Transfer molding starts with a closed mold for precision. Tolerances are tight because the mold remains closed during the entire process. This prevents excess material from spilling over the cavity parting line. Closed molds and the tighter tolerances they provide allow for more intricate and more consistent parts. This, in turn, lowers quality control costs and reduces the likelihood of failures or returns. Higher cavity counts: Fewer pre-forms are needed for transfer molding because one pre-form can fill dozens or even hundreds of cavities. Unlike injection molding, a runner is not used to fill each cavity individually, which reduces turnaround times and costs still further. Simpler tooling requirements: Tooling costs are usually lower with transfer custom molding because the transfer system is not as complex as it is with injection molding. Versatility: Transfer molding is particularly attractive to clients who need colored components because pre-form can be hand cut from sheets of raw material. This procedure greatly reduces the chance of compounds becoming contaminated as they often are during the mechanical preparation prior to compression molding and the screw and barrel process in injection molding. Overmolded and bonded components: Transfer molding starts with a closed mold for precision and is ideal for making overmolded products. Raw materials are quick to mount into a molding press and get you parts quickly, and it is the solution of choice for low or medium volume runs of rubber to metal bonded or silicone to metal bonded components. Increased waste: Transfer molding is a high precision molding technique, but it does produce more waste than injection molding because any material left in the transfer pot after the heated piston has been depressed will be cured. This means that it must be either recycled or discarded. Not suitable for all materials: The use of pre-forms make transfer molding less than ideal for working with filled materials, and it may not be suitable for working with substances that score highly on the Shore Hardness Scale. However, transfer molding remains quite a versatile solution, it's an inexpensive mold to build and is appropriate when working with substances such as EPDM, FKM, HNBR, neoprene, nitrile and Viton. Higher tooling costs: The presses and other machines used in the transfer molding process are expensive, and these costs will usually be reflected in component prices. The molds used are more complex, and the tools needed for transfer molding are difficult to make. Rubber Industries Inc. saves its customers money by taking a proactive approach to manufacturing investment. We purchase the latest equipment and technology and concentrate all of our operations under one vast roof. We've molded with thousands of transfer molds over the years, and we pass these economies of scale onto our clients. More maintenance: Transfer molding tools are more complex and require more maintenance than compression molding tools. Inserts within molds must be removed and reset from time to time to maintain their movement, and special equipment is sometimes needed to clean transfer inserts. Wear and tear: While cavity wear is generally reduced by switching to transfer molding, gate and runner systems are prone to corrosion and tool maintenance costs are generally higher.